BBC NEWS | Africa | Darfur: What's the way forward? Darfur: What's the way forward? Violence in Sudan's western Darfur region has led to what the United Nations describes as the world's worst humanitarian crisis. Some one million people have fled their homes and up to 50,000 people have been killed since conflict broke out in Darfur 18 months ago. The conflict is between rebels, who took up arms to demand more rights for Darfur's non-Arab groups, and Arab militias - known as the Janjaweed. The Sudanese government denies backing the Janjaweed. In early July, it promised to disarm them but there has been little sign of this. There are still reports that the Janjaweed continue to attack civilians. International pressure is now building on Khartoum to fulfil its pledge to stop the killings in Darfur, with talk of sanctions and military intervention. What do you think is the way forward for Darfur? What role should the UN and the African Union play? Should the crisis be resolved through sanctions, through military intervention or through quiet diplomacy? This debate is now closed. Here are some of the comments sent in. An immediate solution is to send a multi-national force to root out the Janjaweed. The Sudanese government is supporting the evil Janjaweed, just as the past Rwandese government backed the 'Interahamwe'. An immediate solution is to send a multi-national force to root out the Janjaweed and if Khartoum resists, they should face allied bombing just like the former Yugoslavia or Iraq. Of course only the US or NATO has proved able to do that. Direct military intervention is appropriate not in Darfur but in Khartoum. This is where evil stems from.The solution is to remove President Bashir, restore democracy and find someone to give Sudan a bold start. It strikes me as hypocritical, that there had been a long civil war in southern Sudan and there wasn't any kind of military intervention by the so called Western powers. It seems to me that the Western countries are being biased by responding instantly to the issue of Darfur. The case for military action in Darfur seems stronger than it was for Iraq. But the AU and UN are too divided to face up to it. What an irony that, after Iraq, the 'Coalition' is wary of stepping in! To make matters worse most African leaders do not have the courage to 'judge' Sudan, and therefore condemn it, as have the US and the UK. Robert Alu, Dar Es Salaam, Tanzania. The way forward for Darfur is through quiet diplomacy. I feel that the way forward for Darfur is through quiet diplomacy as these people have suffered enough and don't need any more bloodshed that may result from military intervention. Like the two past wars in Sudan, the present crisis is a result of the Arab-dominated government's brutal reaction to the genuine grievances of its marginalised black African citizens. I would vote with those who propose a creation of two nations: one for Arabs and another for the black African population. After all Sudan is Africa's largest nation, about five times the size of Kenya. The international community is just like a barking, toothless dog. The 30 days will give the Sudanese government more time to continue killing those helpless and defenceless people. The government of Sudan will never act because the Janjaweed is part of government. The same government of Sudan has murdered two million people in southern Sudan and because of an apparent indifference of African countries, that government is now carrying out genocidal killings of blacks in Darfur. It is absolutely disgusting and insulting to human intelligence and values, that people are being deliberately massacred in hundreds of thousands in Darfur. Yet nations such as China are blocking sanctions because of oil interests in Sudan. It is my opinion that there should be an immediate military intervention in Sudan. Immediate military intervention and sanctions on the Khartoum government is the only way forward. Hoping for an African Union solution is a waste of time. If the world is really concerned, immediate military intervention and sanctions on the Khartoum government is the only way forward to resolving the crisis. Anything less would encourage the Arabs in Khartoum to wipe out non-Arabs in Darfur. After the debacle in Somalia no US government is going to become involved in peace operations in Africa for some time. Perhaps this is an opportunity for the EU and its new rapid reaction force to stop posturing and prove its worth. Everybody knows that sanctions will not work and are only a tactic for governments around the world to claim they are doing something. There are half a dozen nations with the military capacity to intervene in Sudan. It is high time that the EU took a more active role on the world stage. What is the point of creating a new super state that makes no difference? The crisis in Sudan has always taken a racial dimension. Alongside religious intolerance, the degree of hatred keeps rising. Sanctions will not work because they can readily be circumvented. A military intervention is the most feasible option. It's the only language the Arab Sudanese understand. The UN decision on the Darfur situation is too little too late. The UN decision on the Darfur situation is too little too late. 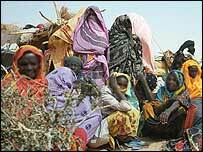 People in Darfur had suffered long enough already and another 30 days of waiting would worsen the tragedy. I think diplomacy should be used right now as we await the deadline given to the government. Should this fail, sanctions can then be imposed. As a saying goes, the one who sits closest to the fire feels the heat. The UN and the AU may feel they are doing their best but frankly, if only one of their representatives spent one night at these camps, it will be enough to 'burn' him or her and perhaps that would provide the much needed sense of urgency in their handling of Darfur. My message goes to the Sudanese government which regards itself as ' Arab.' Stop treating people in Darfur as enemies. They are your brothers, sisters, uncles, aunts, mothers and fathers. It is time for you to realise that you are "Africans" and start playing a greater role in ensuring peace in Africa's largest country. Sudan should be banned from all sporting activities for two or three years. Sudan should be banned from all sporting activities for two or three years, the same way South Africa was excluded during the apartheid era. The African Union has no capacity to intervene in such a big country as Sudan, unless the international community provides logistical support for the operation. The way forward for Darfur begins with the immediate dissolution of the current government of Sudan because it has demonstrated that it cannot reign in the Janjaweed militias. The African Union and the United Nations should use their powers to bring to book all those individuals who are responsible for this human suffering - in other words, military action is the correct dosage. The Rwandan genocide happened because world leaders preferred engaging in the so-called 'quiet diplomacy', threatening sanctions and avoiding to get involved in other countries' 'internal affairs,' as innocent defenceless civilians were being murdered in front of the whole world. A perfect time has come for the super powers to ignore the UN and all international laws and save lives. The people of Darfur should not expect much of a remedy from the AU. An African Union intervention is unrealistic. The African Union is still a theoretical organisation, God knows until when! The people of Darfur should not expect much of a remedy from the AU, and instead the UN must take swift, decisive action with the help of some bold countries. This is about saving Africa from another ugly genocide. I watched a little child today dying of starvation in the Darfur refugee camp and I cried. Yet the bankrupt United Nations has given the Sudanese government another month to stop this human disaster. How many innocents will have to die before the UN does something positive and quickly? I say sack the UN and replace it with the US. What's happening in Sudan is genocide and history might never forgive us if we remain silent. We have to act and act fast. The only nation that has the capacity to make UN intervene here is USA. Intervening here will surely win the support of all right thinking people and will add another feather to the world's most powerful democracy. People are dying and we watch? Another Rwanda again? The international community should go ahead and intervene despite the Sudanese government's threat to fight back. People are dying and we watch? Another Rwanda again? Ooh no. I believe the crisis taking place in Sudan will not be the last. Many African countries are destined to implode in a similar manner. As a continent, Africa can do nothing. Africa has only been good at incubating problems and watch them explode. Take a closer look at any African country, and you will see a mirror image of Sudan. Ultimately, the solution to the crisis in Sudan is partition of the country. The UN is not an institution on which we can rely to resolve ethnic oppression in one of its member countries. The impact of the flight of Darfur residents on Chad gives the UN the only reason for enforcing an end to the Sudanese crisis that is consistent with its raison d'etre. Failing that, the most effective strategy would be to demand intervention by the African Union or even NATO. The killings are the acts of perpetuated racism. The violence is no different from that of Hitler, Rwanda and Burundi. The way forward is for the UN, the African Union and the Sudanese government to recognise the sanctity and importance of human life, and protect it through force and political solutions. The viable political solution is to partition Sudan into two and separate countries, one for the Arabs and one for the black Africans. There must be an end to the dance of death in which Africa has been caught up. The Darfur episode is no surprise but a déjà vu scene in the entertainment serial play of the African Theatre. Up to this point the so- called civilised world's response to famine induced by wars in the Africa has been one of charity and false generosity. They have been conditioned to look strictly at the immediate needs for relieving famine rather than causes of warfare. When the music of "We Are the World" fades away and the relief planes fly off, the shooting and the hunger continue! There must be an end to the dance of death in which Africa has been caught up. It is with great difficulty that I look upon the crisis in Sudan, as an American, as a white person, as a member of the privileged world. When the mother land of all humanity is dying, as indeed Africa is, it is difficult to see a future for mankind, regardless of where we reside. Being a Sierra Leonean, I perfectly understand what the people of Darfur are going through. I was shocked to hear that the AU heads of state summit only recommended a 300-hundred strong force to be sent to Darfur! Anybody vaguely familiar with such humanitarian problems anywhere in Africa should know that that is hardly an appropriate way to respond. Considerable diplomatic pressure has been brought to bear on the Sudan government, but nothing has been done so far. How many people must die or be driven from their homes and have all basic human rights violated before the UN acts in a strong decisive manner. But, what can one expect when Sudan is on the human rights council of the UN? Other voting members who are against a strong action to stop the genocide in Sudan have very poor human right records themselves. Make representatives from the AU and UN sit through a night in a camp where mothers are wailing as their children die in their arms. Make representatives from the AU and UN sit through a night in a camp where mothers are wailing as their children die in their arms. Then make them go out to gather firewood with women and try to avoid being murdered and raped just outside the refugee camp borders. Then let them tour a burned out village with the charred remains of the villagers. Then perhaps the correct time frame and course of action will become very clear for them. If it were up to me alone, troops would have been in Darfur months ago. The African Union must expand and energise the AU Peace force immediately! Military intervention, only by African troops, is extremely urgent at this point. Otherwise, Africans will face another tragedy while the world watches. Yes, we need to do something for the people of Darfur. But, please don't send American troops - the world's worst peace keepers. Immediate military intervention is the only way to stop the genocide taking place in Darfur. The Janjaweed will never feel the effects of sanctions nor respect diplomacy. The UN and the AU must not sit idle and wait for another "Rwanda" to occur in the Sudan. Send troops, and send them NOW! I feel the only way to solve this crisis is through military intervention and quiet diplomacy. To avoid more bloodshed the UN and the African Union should meet the rebels on one hand and the government on the other hand for amicable compromise for the sake of peace. Aaron Anye, Cameroonian in Johannesburg.